Young Galvanizing, Inc.- Tips For Getting A Better Product. Tips For Getting A Better Product! Young Galvanizing goes the extra mile to be sure that the product that you send us gets the best possible finish, but there are a few things that you can do to insure the best finish at the lowest cost. Use a high quality, non-reactive steel with low levels of silicon and phosphorus. Remove welding slag, splatter guard, paint and asphalt. Zinc will not bond in these areas because our cleaners will not remove them. Proper seal welding and bracing prevents warpage in the zinc bath. Examples shown below. Avoid extreme cold working of the product. Castings should be blasted to remove sand and other casting impurities that will cause a rough HDG surface. Markings should be welded, stamped into product, or metal tags wire tied to the product. Very Important! Because we are lowering cold steel into an 850 degree liquid, any liquids in the product will turn into steam. If this steam is trapped in the product it is likely that there will be an explosion. It is necessary to properly ventilate the product you send to us. 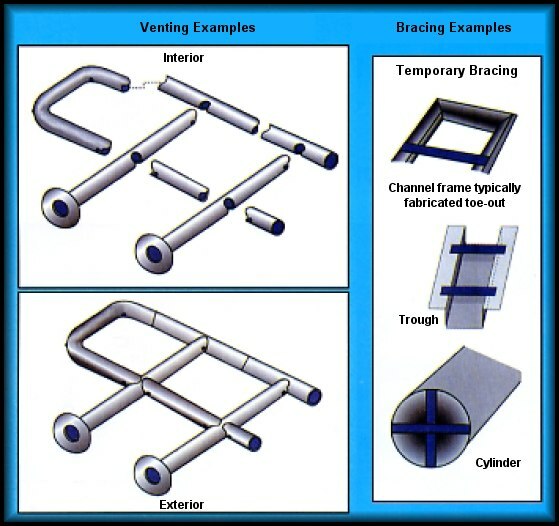 Below you will find examples of proper ventilation and bracing in various products. You will also get a better HDG product if the zinc can flow all through your steel!